“Alvaro Cervantes: Resolute” by Roben Itchoak. Synopsis: Hard work. Education. Family. When Alvaro Cervantes was a child, his father left the family to work in the United States. With hopes that they could keep their children from working in the fields, the women of Fransisco R. Serrano, in the State of Sinaloa, created the community’s first school. This sparked a lifelong interest, joy, and dedication to education. This documentary presents how education changed Alvaro’s life and shaped his family. Producer/Director Bio: My name is Roben Itchoak. I am Inupiaq from Nome, Alaska. I am a Planning, Public Policy and Management student pursuing a master’s degree in community and regional planning. I am committed to helping to preserve indigenous land and culture. This course has shown me how racism, primarily white supremacy, in communities is formed and how it persists because of the perpetuation of race based values, education, and policies within communities. I have learned how to have, record, and share tough conversations about the impacts of racism so indigenous voices can be shared. These types of conversations help redevelop communities that include and value non-dominant values, knowledge and perspectives which over time will preserve indigenous land and culture. “Bryan O. Rojas-Araúz: DREAMless” by Darien Combs and Bryan O. Rojas- Araúz. Synopsis: This documentary encapsulates the DREAMer experience in the U.S. through the eyes of a DREAMer. Bryan Ovidio Rojas-Araúz, reflects on his lifelong journey through academia in the U.S. starting at the age of 13 and the challenges, barriers and victories that have come with his academic experiences and lack of documentation. Today, as a counseling psychology doctoral student at the University of Oregon, Bryan looks back at his story his process of critical consciousness building, identity development and transitions from being undocumented to applying to his citizenship, as well as the shifts that have taken place within himself and the work he has done and continues to do with immigrant communities which have developed his character as a scholar-activist. This documentary explores themes of sociopolitical development, identity development, and documentation attainment, in tribute to the 65,000 undocumented students who graduate from high school in the U.S. each year and the experience of immigrants in the U.S.
Producers/Director’s Bio: Darien Combs: As a first-year counseling psychology doctoral student I believe that listening to and witnessing people’s stories is an essential component of compassion and understanding. By participating in the Latino Roots course, I have gained a broader understanding about the long and complicated history of Latinx communities in Oregon and the Unites States and I have developed a deeper understanding about how to use documentary films as a tool for resistance. Through a participatory documentary, my participant and I collaborated on all aspects of the film to address larger social and political issues of immigration and documentation through the eyes of someone who has experienced it. Bio Bryan O. Rojas-Araúz: As an immigrant of Costa Rican and Panamanian descent, I try to use my experience as a catalyst for the work that I do. My focus is on working with marginalized communities specifically people of color and immigrants. I received my Master’s in Counseling Marriage, Family and Child Therapy with a dual emphasis in College Counseling at SFSU. As community college mental health provider, I worked with Latinx immigrant and undocumented community college students and realized my experiences were paralleled to the student’s I worked with. I’m a Counseling Psychology doctoral student with a Spanish Specialization. My research focuses are Immigrant psychology, DREAMer experiences, ethnic identity formation, Critical Consciousness, postsecondary education attainment and social justice development. I currently work with Latinx, and undocumented youth in an after-school intervention and research program. I’m also a mental health counselor at Lane Community College. I am a self-identified DREAMer, feminist, dancer, poet and scholar-activist. My scholarship is aimed at facilitating the process of immigrant communities in the telling of their own stories, whether it be on paper, film or artistic expression. I hope to support the formation of counter narratives that portray the real lived experience of immigrant communities. “Daniela Cárdenas-Riumalló: Stitch by Stitch” by Andrea Seider. Synopsis: This documentary tells the story of young, female, Latina artist named Daniela. Daniela grew up in Santiago, Chile for half of her life. When she was eleven years old, her mother entered to win the green card visa lottery in Chile. The Cardenas-Riumalló won a diversity visa in 2002 and the family of five left Chile immigrating to Springfield, Oregon. The film touches on the struggle of learning a new language and forming a bicultural identity as a young person in the United States. Through the freedom of expression discovered in painting and drawing, Daniela has learned to communicate her emotions with shape and color. Watch Daniela’s transformation as a young artist living between two cultures. Producer/Director Bio: The Latino Roots course and its instructors offer a hands-on style of learning which was exactly what I was searching for in a class. As a senior studying the Spanish language and its speakers, I took this course knowing it would fulfill my elective yet not fully comprehending what might develop throughout the two terms both within my work and my self-understanding. Guided by the ethnographic research presented in class regarding topics such as the concept of borders, whiteness, migration and our own ethnic identity, I was challenged to fulfill brand new roles of project manager, oral historian, documentary producer, director, and editor. Little did I know, I would also gain meaningful relationships with my classmates, my instructors and my warm-hearted, fearless subject, Daniela. “Diego Vásquez Martínez: De Oaxaca a Oregon” by Romario García Bautista. 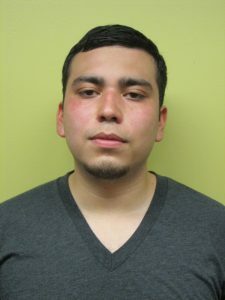 Synopsis: Diego Vasquez Martinez is a junior at the University of Oregon majoring in Computer Science. At the age of 9 Diego moved to Oregon from Santiago Apóstol Ocotlán de Morelos, Oaxaca, Mexico. Throughout this film we learn more about Diego’s journey adapting to life in the United States as well as understanding how his cultural influence has shaped him into who he is today. Producer/Director Bio: Romario Garcia Bautista is a 3rd year Journalism and Anthropology student at the University of Oregon. Born in San Bernardino, California to indigenous Zapotec migrants, Romario’s passion is to tell stories through different media in order to equitably represent marginalized communities. “Edward Olivos: A Trajectory of Advocacy and Education” by Brenda García Millán. Synopsis: Dr. Edward Olivos is a professor and head of the Education Studies Department at the University of Oregon. He initiated his career as a bilingual classroom teacher in San Diego Unified District. The beginning of his career coincided with the 1990s anti-immigration and anti-bilingual campaigns against Latinos in California. The documentary follows Dr. Olivos’ journey as an activist and educator. 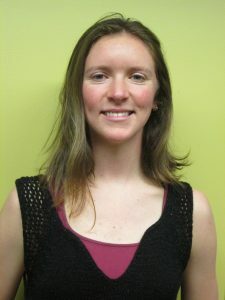 Producer/Director Bio: I am second-year graduate student in the Department of International Studies. Growing up in the US-Mexico border, I have witnessed the impact of immigration legislations on the everyday lives of people. I currently focus my research on transnational migration and refugee issues, more especially on the response to the massive arrival of Haitian displaced people to the city of Tijuana, Mexico. I took the Latino Roots course based on my interest in story-telling and journalism. Taking this class has enabled me to understand the effects of racial formations and policy on American society. Furthermore, this course has thought me the significance of documenting the stories of those whose voices are not always heard. “Gisselle López Ixta: Giselle’s Path to Activism” by Juliza Ramirez. 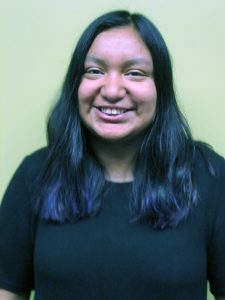 Synopsis: Giselle Lopez-Ixta is a community organizer from Woodburn, Oregon. Giselle was born in Apatzingan, Michoacán, Mexico and crossed the Tijuana border to the United States at an early age. The documentary speaks of Giselle’s journey as a Chicana scholar, activist and mentor. Giselle’s story points out the importance of having Chicanx students/activists reaching for higher education while organizing in their communities. 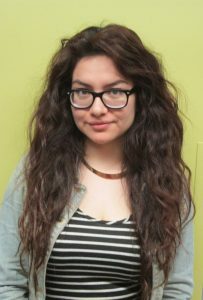 Producer/Director Bio: My name is Juliza Ramirez and I am a sophomore at the University of Oregon. I am an Ethnic Studies major wanting to go into health policy. The Latino Roots class has helped reflect on activism work within my community and how I can get further involved as a student. “Gloria Itzel Carbajal Jaimes: A Girl from Bejucos” by Timothy Herrera. Synopsis: This documentary is about Gloria’s trans-border journey from being born in Tejupilco, Mexico, to being raised in Texas, to beginning her career in Oregon. She recounts how her experience of being raised in Austin, Texas, has shaped her identity and her goals for the future. She and her family have had to overcome adversity and hardships growing up, so her parents expressed to her the importance of education which has inspired her to continue to share its importance to the next generation. She is currently an educational assistant at an elementary school in Eugene, Oregon. The word, Xicana, showcases that she feels a strong connection with her dispossessed indigenous Mexican heritage as well as her American identity, representing aspects of both of those identities. Producer/Director Bio: Timothy Herrera is a first-year graduate student in cultural anthropology. His research focuses on how local ethnobotany strategies in Latin America can explain how people’s relationship with the environment have changed, adapted, and defended in relation to the effects of colonialism and coloniality. Being part of the Latino Roots course was an amazing experience because the class taught me about a large history of Oregon that often gets overlooked or ignored. As a Latino that just moved to Oregon, the most impactful part of the class is being able to contribute to strengthening the Latino history in this state. I feel that my documentary, “A Girl from Bejucos” about Gloria Itzel Carbajal-Jaimes, is an important story that many Mexican-Americans can connect with as she speaks of her two intertwined cultural identities. “Gustavo Balderas: Education as a Pathway Out of Poverty” by Joan Haran. Synopsis: Dr. Gustavo Balderas talks about his upbringing as the US-born child of Mexican migrant laborers who settled in Nyssa, Oregon. He explains the importance of education in providing his own route out of poverty, and the importance of mentors setting out the path for him. He discusses his motivation to work in education as a way to give back to the community and his role as the co-founder of the Oregon Association of Latino Administrators and its mission to increase the presence of Latinos in power in Oregon. Producer/Director Bio: Dr. Joan Haran was a Marie Skłodowska-Curie Global Fellow in the Center for the Study of Women in Society between December 2015 and November 2017. 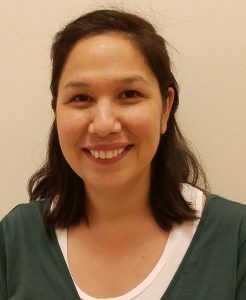 She audited the Latino Roots course to develop skills in video ethnography and to understand more about the history of Latino immigration in Oregon and the important contributions that Latino immigrants have made to the state. “Juan Camacho: Punk, Pride & Promises” by Emily Robinson. Synopsis: The documentary, Punk, Pride and Promises, explores the life of a hardworking, dedicated and passionate man, Juan Camacho. Born and raised in Los Angeles, Juan, with the painstaking support of his mother, was able to surmount the adversities of being raised around a tumultuous relationship with his father, and stereotypes put on Juan for being Latino. With a father who rejected America and “American ways” and a mother who embraced it, Juan struggled to find where or how he fit in in his hometown of Redondo Beach. With the push of his mother to be independent and try exciting, new things Juan found himself at a Punk show. Little did he know it was this concert and this genre of music that would eventually provide him the opportunity to take the space in this world he deserves and shape his identity. After realizing his love of punk and the unhomogenized, creative and political atmosphere it allows, he started a punk band with a good friend, Bruce. They named their band The Detonators. After becoming quite successful, The Detonators spent several years on the road touring all over the United States and Europe. In one of their tours they played a show in Eugene, Oregon where Juan became notably fond of the immense greenery, river and the college town vibes. He became bound and determined to move to Eugene one day and eventually he did. Juan spent years in Eugene living and working, making connections, as well as opened several versions of his restaurant, Sandino’s, a Mexican/political-punk eatery. Ultimately, he remembered the promise he made to his mother and himself to go to school by the time he turned fifty. Juan stayed true to his word, and began his next journey in academia. 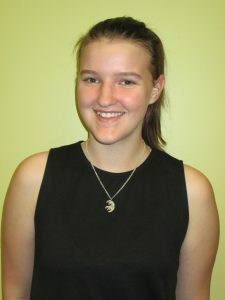 Producer/Director Bio: I am currently an undergraduate student majoring in Spanish and Pre-Nursing. I decided to enroll in this course so I could do more extensive research and further my knowledge of the racial history in regard to Latinos in Oregon and the United States– an essential and often overlooked part of this country’s history. It has been a humbling opportunity to take Latino Roots I and II, as I have developed a deeper understanding and appreciation of what America and being an American means. This class has also taught me the intricacies of creating a oral history project. I can surely say I now have an even greater respect for filmmaking. “Justin Sandoval: Growing Community (Creciendo Comunidad)” by Clara Schneid. Synopsis: “Growing Community” is the story of Justin Sandoval, a graduate student in the University of Oregon’s Planning, Public Policy and Management department. 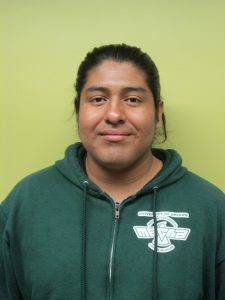 Justin shares his experiences living in Eugene with a Mexican-El Salvadoran-American cultural perspective. This perspective shapes the way he approaches public planning, and guides his ideas surrounding equity, relationship-building, and public policy. His reflections do not attempt to tell the story of being multicultural in Oregon, but rather briefly share his unique viewpoints and visions for the future. 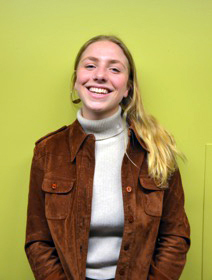 Producer/Director Bio: My name is Clara Schneid, and I will graduate this month with an undergraduate degree in International Studies, with minors in Spanish, Latin American Studies, and Nonprofit Management. I cannot begin to express my gratitude for the opportunity this course has given me to learn about Latin@ experiences in Oregon, and the political and emotional struggles of identity, building community, and feeling at home. I’m especially grateful for the (sometimes frustrating) process of compiling someone else’s story ethically, and presenting it in a creative form. I hope to continue listening to stories, digesting them creatively, and sharing them ethically, to continue a cycle of empowerment and knowledge. I currently work on a nonprofit farm, and hope to continue exploring all sides of agricultural sustainability and food justice. “The Beauty of Both: Leo’s Story” by Makinna Miles. Synopsis: Leo’s story takes place in Central Oregon and explores his Mexican-American identity and how it has shaped his world view. Through a discussion about family, education, and traditions, Leo shows us the beauty in having a foot in both cultures and how the duality of his identity has enriched his life so far. In his narration, Leo stresses the importance of compassion and small-scale, educated conversations to create change and address stereotypes. Leo’s story serves as a reminder about the impact of honest and open dialogues about race and ethnicity, and about the complexities of identity that are rooted in more than just labels or points on a map. Producer/Director Bio: I am a sophomore at the University of Oregon majoring in Cultural Anthropology and Spanish, and I thought that Latino Roots I and II would provide the perfect opportunity for interdisciplinary research. Through this course, I have gained a deeper understanding for Oregon’s racial history and the diversity in Latino communities. The Latino Roots class has connected me with people and programs to further my education and research, and has made me a better communicator, ally, and activist. “Maria Bené Santos: Bené” by Emily Masucci. Synopsis: In Bené, Maria “Bené” Santos offers reflections on her lifelong journey as an educator, which brought her from São Luís do Maranhão, a city in the northeast of Brazil, to Eugene. Today Bené works as a Portuguese lecturer in the Department of Romance Languages, but her interest in education extends far into her childhood. As a young girl, Bené would emulate her teachers, lining up her dolls into rows and using a small chalkboard to instruct them. This documentary explores themes of identity, immigration, and perseverance through Bené’s testimony about the problematic and difficult moments she experienced as a student and an educator in the United States. Her reflections highlight the dual identity that she embodies—travelling and living in both the US and Brazil—and the (dis)connections that have come about as a result. 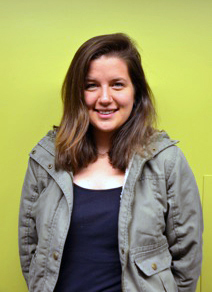 Producer/Director Bio: Emily Masucci is a first-year graduate student in anthropology. 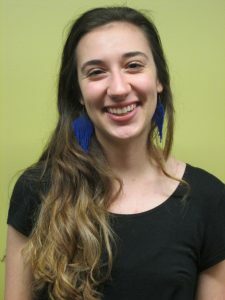 Her research centers around indigenous women’s organizations and social movements in Brazil and considers the lived experiences and epistemologies that indigenous women draw on as they organize politically. “Mateo Amezcua: An American Story” by Juan Camacho. Synopsis: The documentary is about Mateo Amezcua, who came to the United States as a young man and without any reading or writing skills. Mateo worked his way to Eugene Oregon, where he started a family and his own landscaping business. Mateo explains in his own words the risks he took with his future and the ways in which he survived in the world by never giving up and meeting the challenges of making a living with the handicap of being illiterate, but at the same time proud to be an American. Producer/Director Bio: Juan Camacho is a Cultural Anthropology major at the University of Oregon. 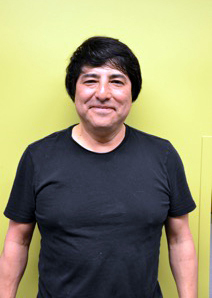 Juan came to Eugene, Oregon in the early 1980’s with his band, The Detonators. Juan Camacho traveled extensively with his band and later owned and operated two restaurants here in Eugene. His mission was to meet his promise to his mother that he would someday return to school and get his degree. Juan lives with his love and companion, Elizabeth Sake and looks forward to fulfilling his promise to his mother, Ney, and graduating from college. “Norma Caballero López: Putting the Pieces Together” by Andrea V. Castillo. Synopsis: This documentary is about Norma Caballero-Lopez. She is a Latina woman, born in Cutler California with 10 other siblings to Mexican immigrants. Her parents came to the United States through an agricultural labor program in 1964, similar to the Bracero Program, and Norma talks about how being a farm worker for the most part of her life has impacted her in the person she is today. Another focus of the film is Norma’s involvement as a Social Worker in the department of Domestic Violence. She explains the hardships of domestic violence and what that looks like, not only in society but also in her own life. Norma is an advocate for women and women’s rights against violence. Producer/Director Bio: My name is Andrea V. Castillo. 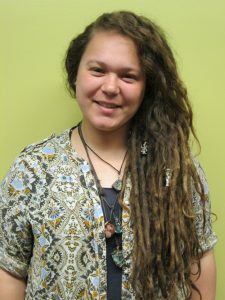 I am a second-year student at the University of Oregon with a major in Anthropology and a minor in Spanish. I feel that through this class I have understood and learned more about Oregon in particular and the history behind the injustices on minority groups, not just the Latinx population. Working on this project has made me become aware of my own history while listening to who my grandmother, Norma, is. Latino Roots has been an experience where I gained skills that I will be able to use later in life. “Norma Scovell: Norma” by Heidi Rangel. Synopsis: The documentary NORMA, captures the journey of Norma Scovell from her upbringing in Del Rio to her current residence in Oregon. Norma, a U.S. born child of immigrant parents from Ciudad Acuña Coahuila, Mexico, is a tutor in the Spanish language department at Lane Community College. Growing up, Norma was encouraged to celebrate her culture by her parents. She recalls fondly taking trips with her parents to Mexico. Those memories are held dear by Norma, from seeing Mexican artists such as Lola Beltran to visiting the pueblos with her parents offering clothing and household items to the villagers. The value of giving was instilled in Norma from a young age, and she considers it an integral part of her life today. When Norma came to Eugene in 1980, she found that there were few Latinos in her community, a stark change from her upbringing in Del Rio. Through volunteering in the community as a translator and educational assistant to English as a second language speakers, Norma was able to fulfill her love of education, practice her love for her first language, give to her community, and stay connected to her culture. 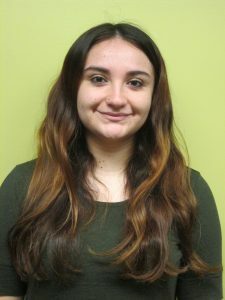 Norma decided to go through the Spanish language program at LCC to solidify language concepts that could enable her seeking occupation in the 4J school district. After completing the program, she was encouraged by her instructors to pursue work at the community college. 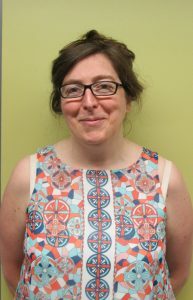 Norma has been a tutor in the Spanish department at LCC since 2005. Producer/Director Bio: I am a Cultural Anthropology major. Taking Latino Roots I and II has been the most incredible experience of my education to date. These courses offer edification on colonialism, migration, perceptions of race, and the profound impact Latino people have had, in Oregon’s history. As an anthropology major I found myself developing important skills in conducting and interpreting oral history, as well as perspective on methods of evaluating cultural history and how it informs the present day. Exposure to the substantial history of Latino people in this state has become only expanded, as my classmates and I explore the rich backgrounds of our respective documentary participants.